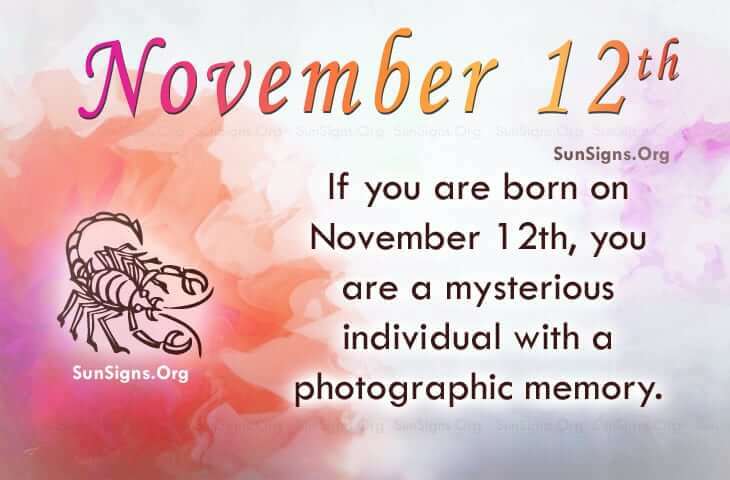 Famous people born on NOVEMBER 12, as a Scorpio can be mysterious individuals. This quality seems to attract other people but they like staying to themselves. They don’t tell everything to everybody not even to their loved ones. Being the person they are, they can be offended by something and want to get back at the person who hurt them. Otherwise they are upbeat and aspiring people. In love, famous people born on November 12 love hard but trust could be another thing. They have not had much luck in the love department. They should try dating someone born under the zodiac sign Gemini. They both are doting individuals and would enjoy each other’s company. Famous November 12 celebrities have an ingenious side that is extremely useful as an author or writer. It’s possible that they have a niche to write music. However, they have many other talents that gives them the ability to choose their profession. Famous people born on NOVEMBER 12th love testing their abilities. It would seem as though they have a photographic memory. They do not forget much especially when it comes to those who have done them wrong. But remember, forgiving is a key to living a healthy life.